The Dove's Corner: Never give up on what you feel in your soul to be true...#daily dose of inspiration ! Never give up on what you feel in your soul to be true...#daily dose of inspiration ! 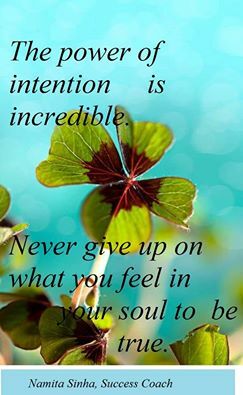 "The power of intention is incredible. Never give up on what you feel in your soul to be true." If you understand what you truly want and what you stand for, and if you have all the courage to pursue it with sincerity ...there's nothing stopping you from achieving it..